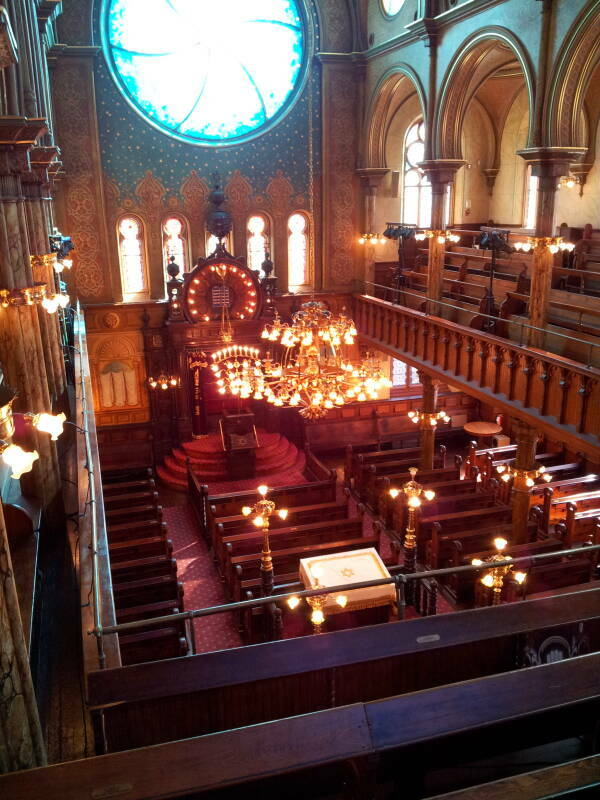 The Eldridge Street Synagogue is often said to be the first Eastern European Orthodox Jewish synagogue in the U.S. If it isn't the very first, it's very close. It was completed in 1887. Services had been held in tenements and small shops. The construction of this grand new synagogue meant that up to 1,000 people at a time could attend services. It's at 12 Eldridge Street near Division. The vaulted ceiling is 70 feet high. 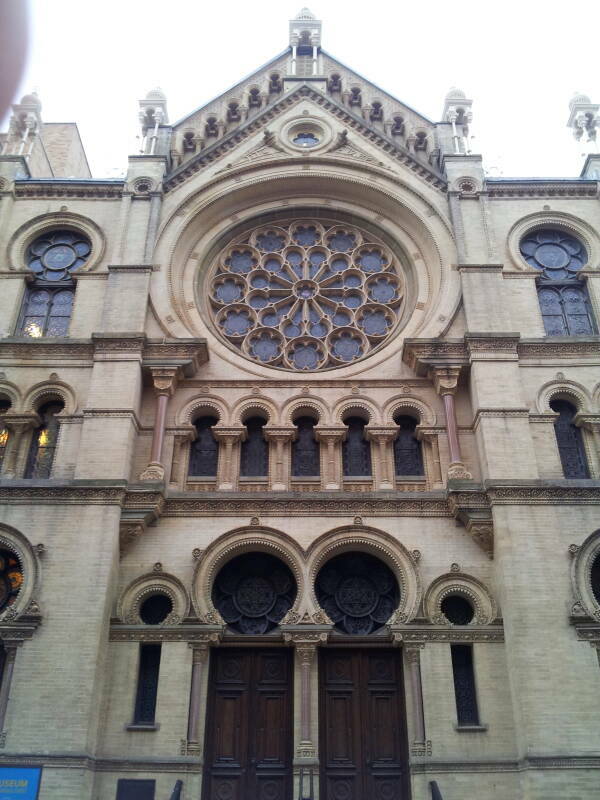 The main rose window has twelve Stars of David in stained glass, representing the twelve tribes of Israel. On the east wall, facing Jerusalem, is the Aron Kodesh, the ark storing the Torah scrolls. 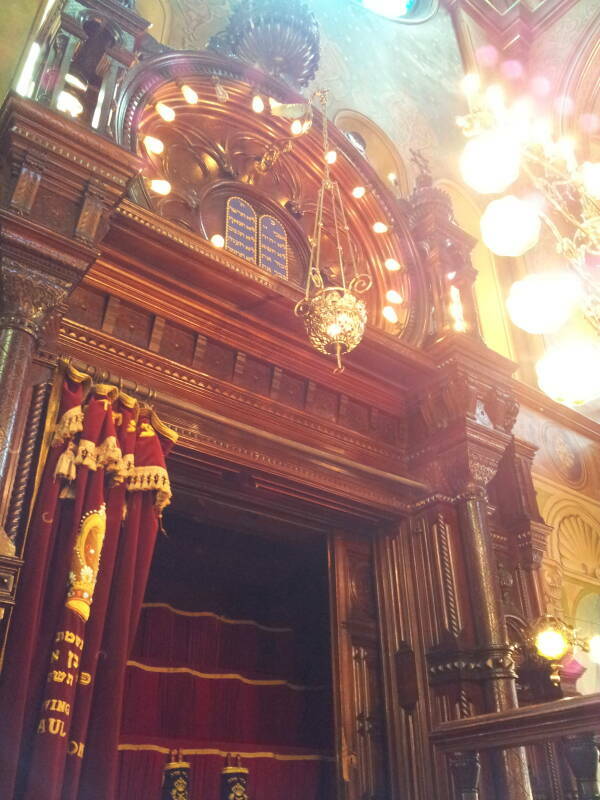 The ark in this synagogue is hand-carved from walnut, lined with red velvet, and was installed when the synagogue was opened in 1887. 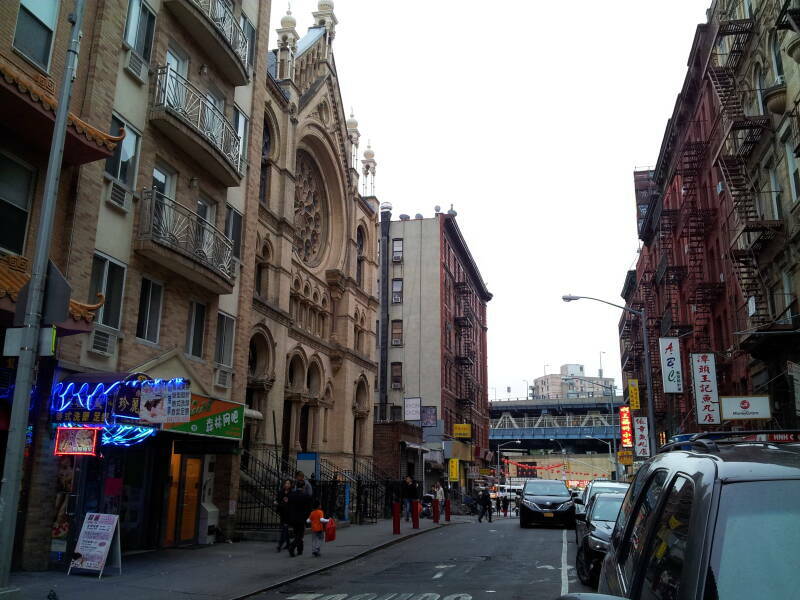 The synagogue at 12 Eldridge Street with the west end of the Manhattan Bridge in the background. Up to 1,000 people attended services around the turn of the 20th Century, but the Jewish population in the neighborhood began dropping in the 1920s. The Immigration Act of 1924 had cut off further immigration from Eastern Europe. 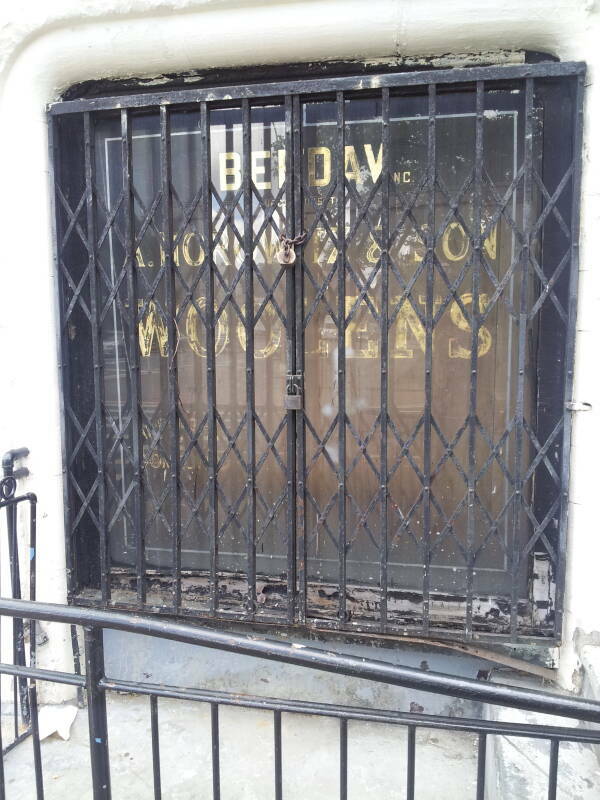 The synagogue was closed in the 1950s. 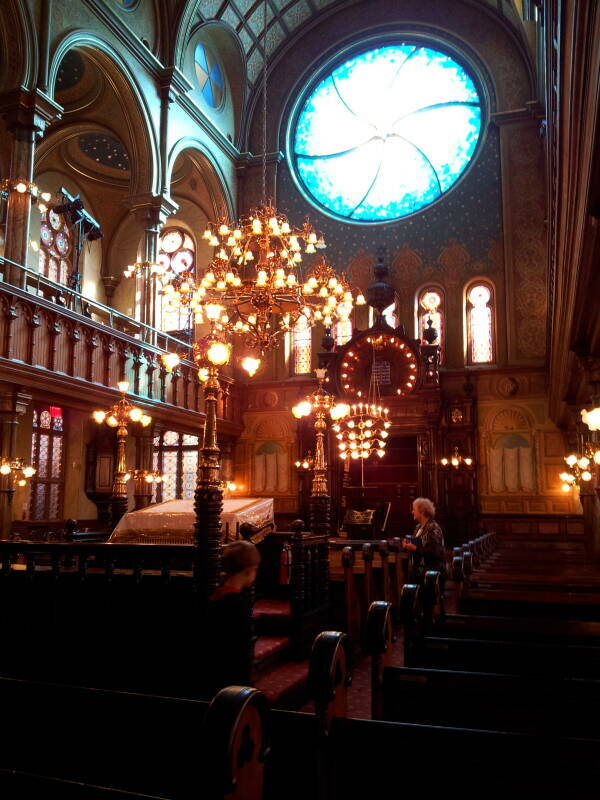 It was restored in 2007 and is now officially the Eldridge Street Synagogue and Museum, although it holds weekly Orthodox services every Saturday. The bima in the center of the sanctuary, with the Aron Kodesh or Torah Ark and the Ner Tamid or Eternal Light. The Aron Kodesh or Torah Ark. 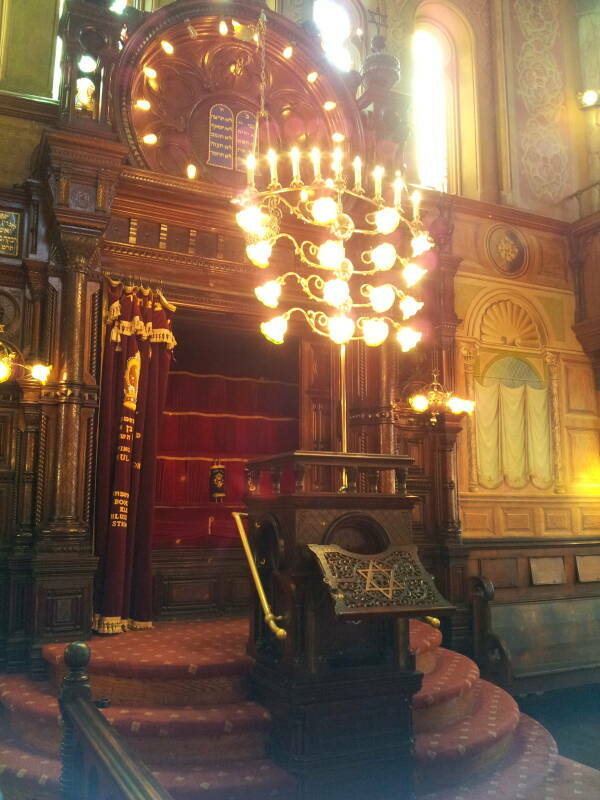 The Aron Kodesh or Torah Ark and the Ner Tamid or Eternal Light. A view of the sanctuary from the women's section in the balcony. The Kletzker Brotherly Aid Association was founded by immigrants from Клецк in Belarus, Kletsk or Kletzk as it was known then in Polish and Yiddish. This was a mutual-aid society, which helped newly arriving immigrants with medical care, moral support, and social activities. The society was founded in 1892. In 1911 they built this headquarters building. Kletzker Brotherly Aid Association at 5 Ludlow Street. The Kletzker building has housed a series of funeral parlors. First Jewish, then Italian, and most recently Chinese. In March 2016 the building suffered a fire that spread from a Buddhist funeral in the Boe Fook Funeral Parlor, where papers inscribed with prayers were being burned. 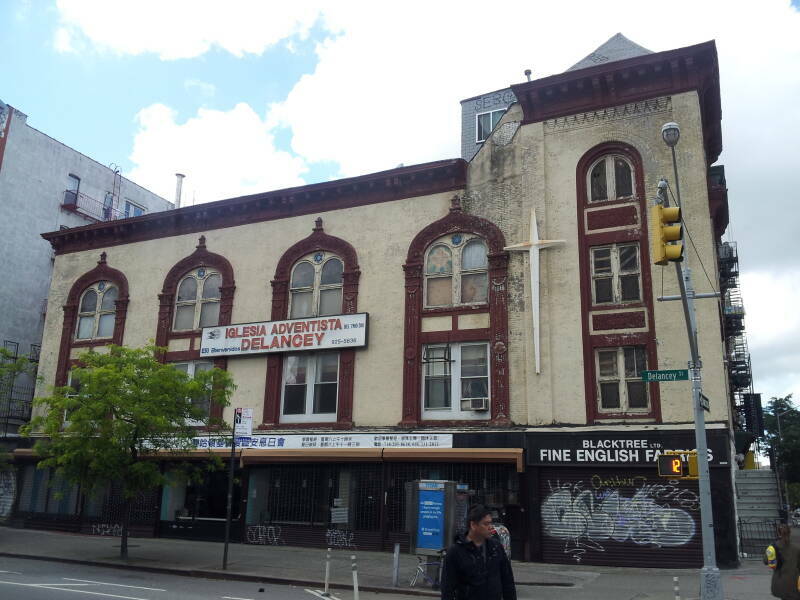 The building on the southeast corner of Delancey and Forsyth was built in 1890 and was initially home to another missionary group attempting to convert Jewish immigrants to Christianity. They soon sold the building to Chevrah Poel Zedek Anschei Illia, a small group of immigrants from the shtetl of Illia in the province of Vilna, Lithuania. They had moved from one small rented location to another across the Lower East Side for about ten years. Before long they had become prosperous enough to have their own large synagogue with a cantor, choir, and rabbi. They renovated in 1909, adding retail storefronts that helped the congregation to thrive. But like other congregations, they began to decline in numbers in the 1920s. They stayed there until the 1960s when they sold the building. The new owners removed the dome on the roof and the large rose window above the main entrance. But many of the original decorations remain visible on the exterior today. By the 2010s the building was home to Templo Adventista del Septimo Dia, the Seventh Day Adventist Church. And by 2017 that church was looking for a developer to replace the building. 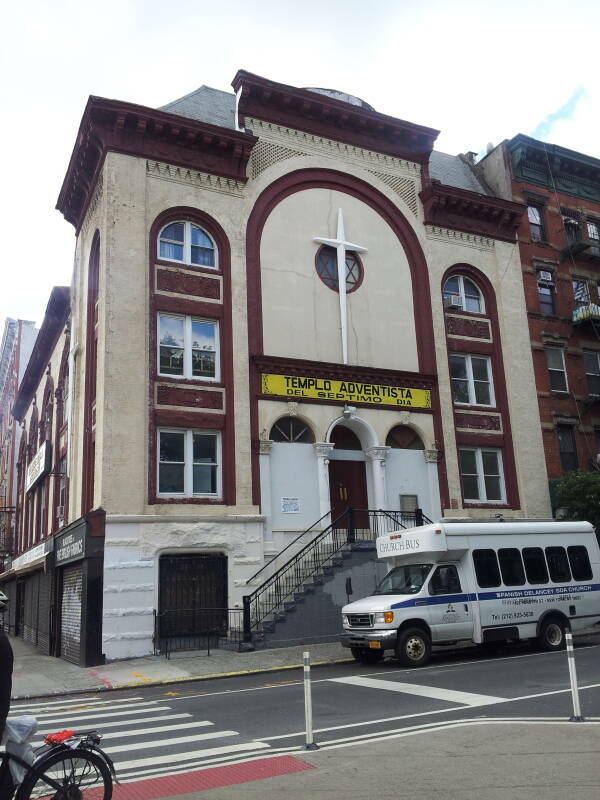 They are looking for a deal where the church takes the first three floors of what could be a 120-foot building with about 27,000 square feet of residential space above. They are looking for a $7 million cash payment from the developer, control over design, and a place to meet during construction. Signs of the retail businesses remain. 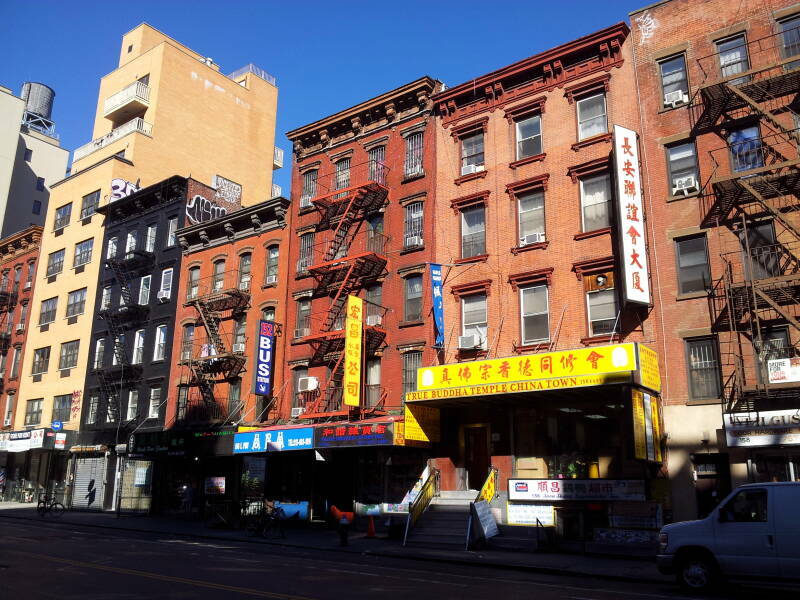 Chinatown has expanded northward. 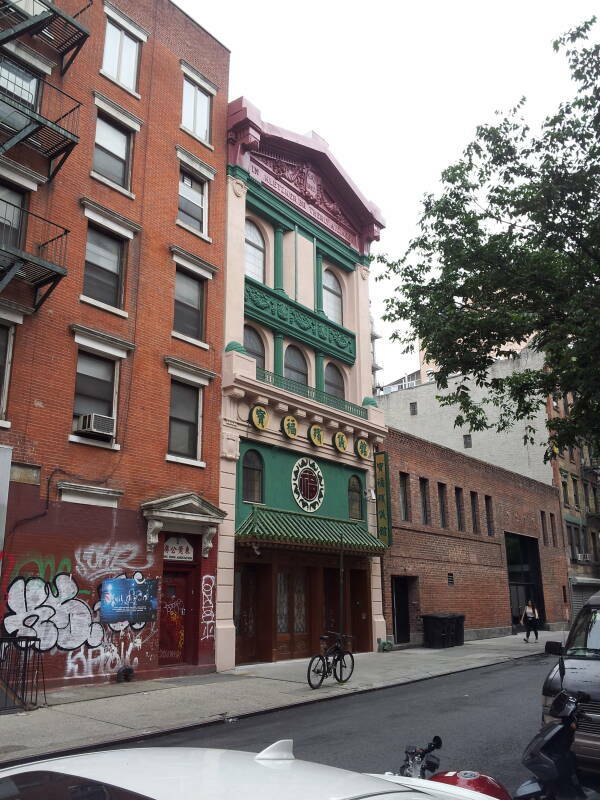 Only a few synagogues still operate in the Lower East Side, but the number of Buddhist and Daoist temples has been increasing. 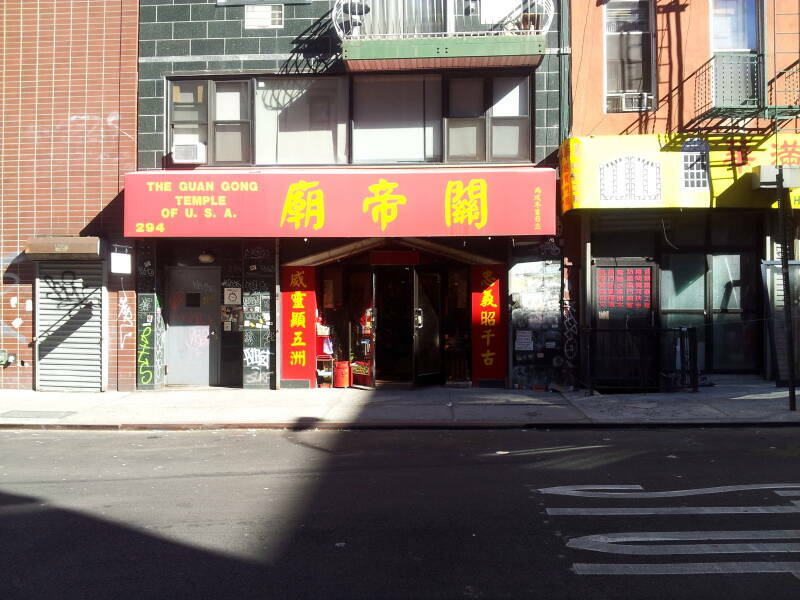 The Eastern United State Taoist Association is on Spring Street, just over a block west of Bowery. 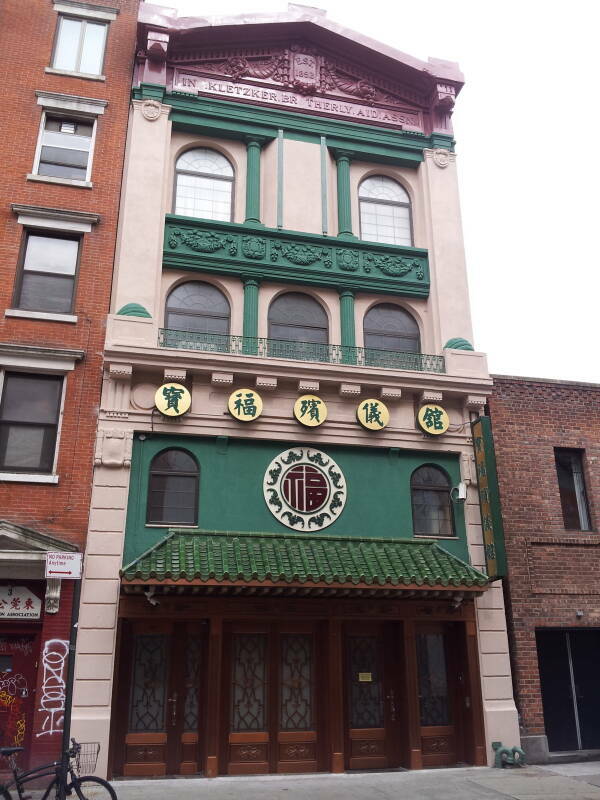 Many of the Buddhist temples are ground-floor operations in former tenement buildings. 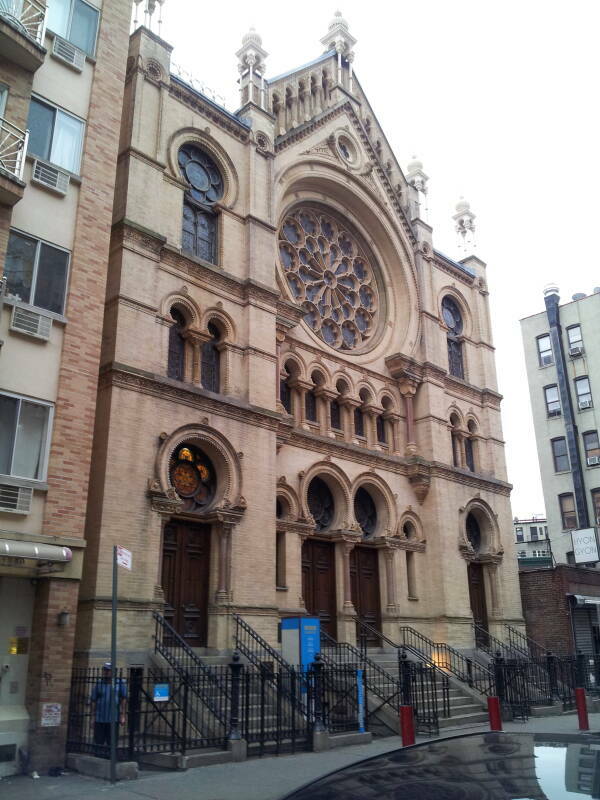 This puts some of them in the same locations occupied by storefront synagogues in the late 1800s and early 1900s. 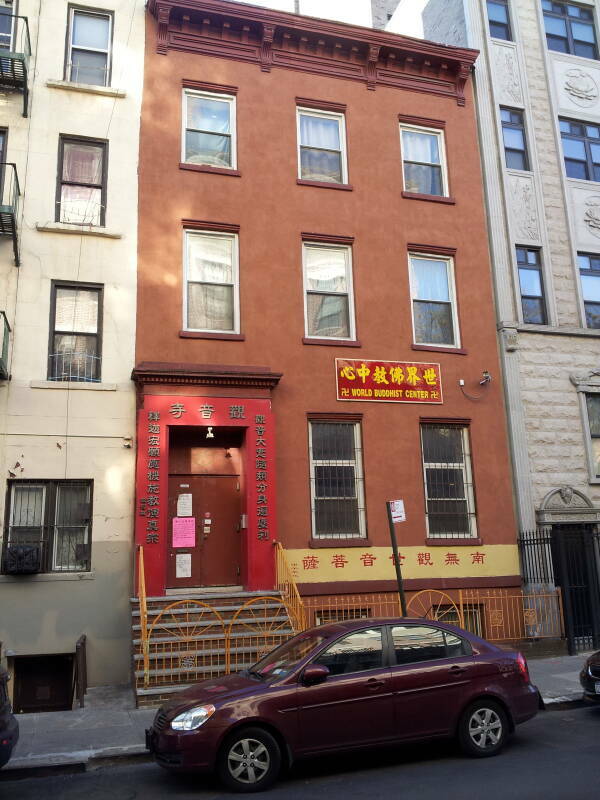 Eastern United States Daoist Association at 16 Spring Street. 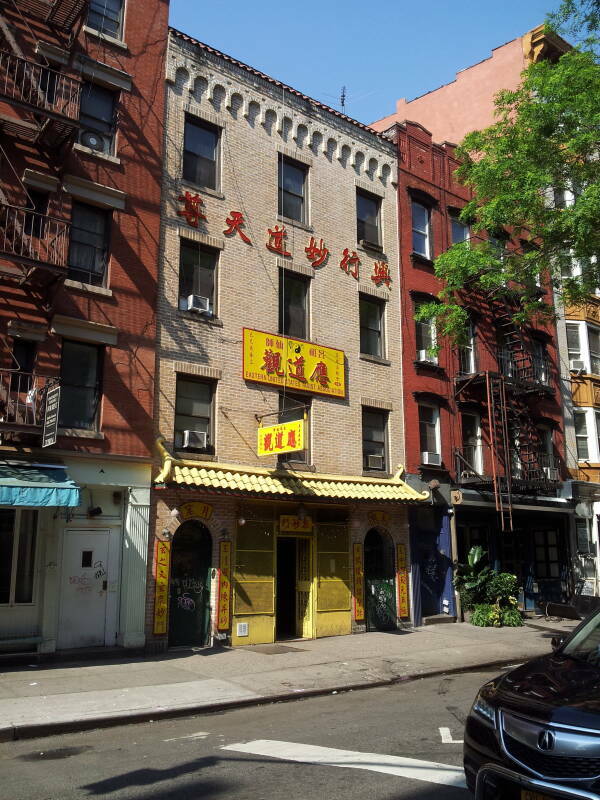 Guan Gong Temple at 294 Broome Street. True Buddha Temple on Canal Street. World Buddhist Center at 158 Henry Street. 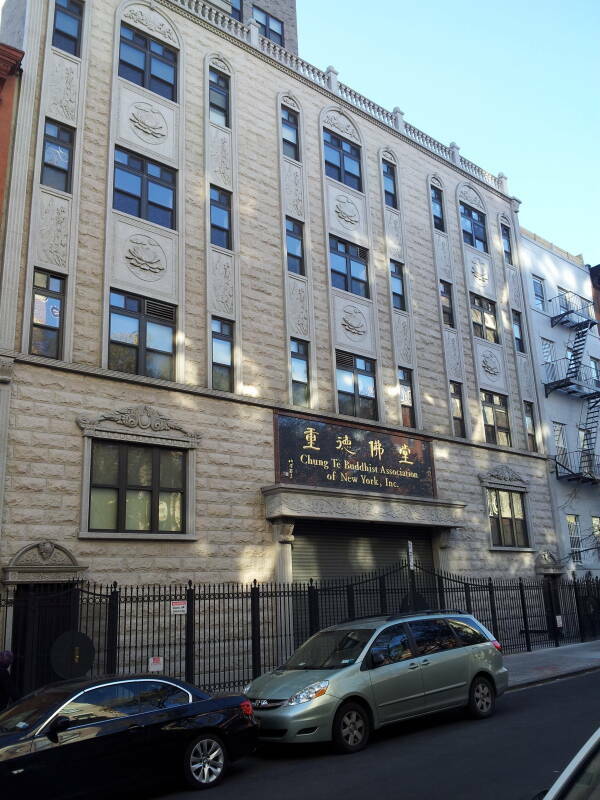 Chung Te Buddhist Association at 152 Henry Street, the home of the Society of the Supporters of the House of Sages from 1940 to 1989.